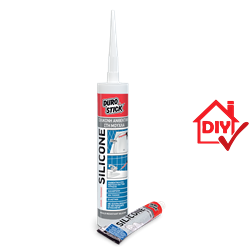 Highly flexible silicone that is long lasting, with excellent adhesion to non porous surfaces. It resists mold and mildew creation on its surface, adverse weather conditions and UV radiation. It is resistant to detergents, acids and sea (salt) water. Its reaction to humidity assists the product to set quickly. It exhibits excellent bonding strength and long lasting durability. It does not burst nor peel, even when filling joints that require high flexibility. Use it safely without priming, on materials such as porcelain and glass, ceramic, enamel, polyester, stainless steel and anodized aluminum as well as varnished wood etc. It is suitable for sealing joints from 3-40mm wide, both indoors and out. Indicatively, one 280ml cartridge fills 8 linear meters of a 6x6mm joint.